You know that we want to use this blog to raise disability awareness and I think part of that is to amuse and educate our loyal followers. I hope that Dan and Casper are doing a great job with the amuse part. I know I love their posts. And I hope I am doing a good job with the latter. I think this post might do a little of both. And I know it will pull at your heart-strings. You, my dear readers, have some of the biggest, kindest hearts of any people I have known. I have come across a lot of articles over the years about animals with disabilities. They are heartwarming and adorable. I would love to share them all and one day maybe they will all make it to this blog. Right now there are two stories in particular that really got my attention. Most of you have probably heard of these stories, especially if you follow us on Facebook, but I can’t help writing about them because I LOVE THESE TWO STORIES. First, I am going to preface this with a little bit of sad information. I wish I didn’t have to do this, but it is really important to be aware of how little is really being done for disabled animals. There are amazing people and groups out there (like the ones I am going to share) but they can’t begin to help all the animals out there that need it. I hope that sharing this here and asking you to share it with others can raise some awareness about this issue. Just like humans, animals are born with disabilities every day. Sadly, 90% of these animals are euthanized at birth. Then there are animals who develop a disability, either through genetics or accident. Animals with hip dysplasia, traumatic brain injuries, or loss of a leg can cost an owner a lot of money to heal or treat and these animals are often either put down as well or surrendered to a shelter. Many animals just develop issues with age, such as hearing or vision loss. These animals usually suffer the same fate. I go on Petfinder all the time. I don’t know why I do this. I have 3 cats as well as Casper, but I still look ALL THE TIME. (I do the same thing with Realtor.com.) Just last night we found a golden retriever mix on there. She was shot in the leg (according to the shelter no one knows who actually shot her) resulting in her losing that leg. It was a front leg which actually causes very few issues with a dog (the back leg can cause much more difficulty with mobility because they bear more weight). She was surrendered to a shelter, however, because her owner said she was “no use to [him] now.” And this was a dog who would have no further medical issues and was perfectly healthy and happy. Imagine what happens to a dog with more severe issues. It is a little heartbreaking to me. And then there is a light at the end of the tunnel in the form of the stories I find online. I get these stories from some Facebook posts, some blogs I read, and mostly from Huffington Post. They have a section called Good News. I go there every day to feel lifted up. Their Impact section is also full of really amazing stories about people helping each other and also worth looking at every day. Even as I write this another great story about two disabled dogs has been shared on Good News, but I will save that one for another post. On with the cute stories!!!! Lentil Bean is the most adorable French Bulldog I have ever seen. (And I LOVE French Bulldogs!) And it just so happens that today he is 6 months old! See? I told you he is cute! 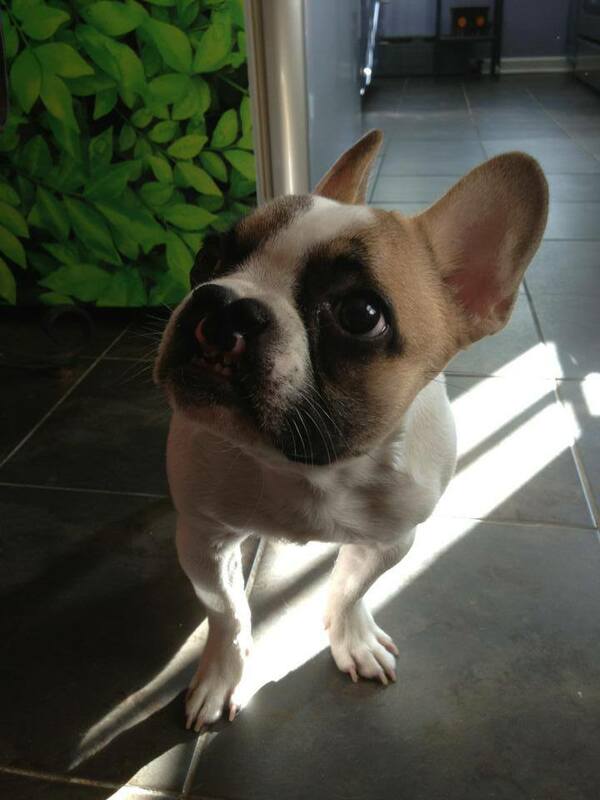 Lentil was born with a cleft palate and lip. In the wild this is a death sentence to any animal. And sadly, it is often the same story when a breeder/owner can’t afford surgery or is just unwilling to help the poor animal. His owners relinquished him to the French Bulldog Rescue Network who found him a foster home and then a forever home. After being fed with a tube as a baby he was given surgery to correct his cleft palate, but not his cleft lip. The lip does not have any effect on his health so there is really no need other than cosmetic. Now Lentil is an ambassador to children who have similar defects. He visits the Children’s Hospital of Philadelphia and even made an appearance at the Children’s Craniofacial Association‘s retreat for children. I think this is such a wonderful way to boost the morale of children who might have insecurities because they don’t look like anyone else. Well, neither does Lentil and look how everyone loves him. Dogs are such an amazing link between human beings. I know we have made many friends we might have never met since we were given Casper. And he also helps open people up to a discussion about Dan’s disability that people would have been uncomfortable with before. Thank you, Lentil Bean, for showing us that it is what we are that matters, not what we look like. You can learn more on Lentil’s Blog or his Facebook Page. And then we come to Mick, the Boston Terrier. Look at this little man! I just want to kiss that smooshy face! Mick was born to a breeder in Oklahoma. She immediately spotted symptoms of “Swimmers Puppy Syndrome.” This is a condition where his chest and abdomen were flat, causing his legs to stick out to the sides rather than down. It is also difficult for these dogs to hold their heads upright. Most puppies with this condition are euthanized or contract pneumonia and die. This breeder, unlike so many, sought help. She brought Mick to The Mia Foundation, a group dedicated to giving animals with birth defect a chance at life. Their founder, Sue Rogers, initially didn’t think there was anything they could do, but this woman doesn’t give up. After hours, days and weeks of therapy this doggy is now not only walking, but running!! You have to see this to believe it. This little man-made me cry happy tears. He was so determined once he figured out what to do. I have to offer up my utmost gratitude to his breeder and the people at The Mia Foundation for being as determined as him. Too many people would have given up. Just look what can be accomplished if you have your heart in the right place. So there you go, guys. So much love out there. In the darkness of the world when you are feeling low, just watch these little guys. Go online and find more inspiring stories. Go find your own inspiring story. There is so much love in this world. Go forth and be the love yourselves. Do it in honor of these brave little pups. Do it in honor of Casper, our own brave boy. He will be so proud of you.